This my second vuelta al cole in Spain, the second time I have been here at the start of a new school year, when summer winds down, temperatures become pleasant, and town gets quiet. The first was a non-event as nobody in our family went to school, to the surprise of our neighbours. This time round has been quite different with my four-year old now officially escolarizada, which actually meant braving the seasonal flurry of stationery to buy books (for preschool!). She wasn’t the only one. I am now enrolled in the Casa de la cultura for Spanish lessons twice a week, as I attempt to keep up with my daughter as long as I possibly can! This is the third time I have moved to a new country and thrown myself into learning the local language. But this time is more complicated than the previous two. The first time was the simplest: I moved to Paris and immediately started a French degree. I knew a lot of other English students but I did plenty of activities in French, listened only to French radio, wrote all my notes in French, and read constantly in French. I had no internet at home for the first two years, so no BBC Radio, no English TV, no Skyping family all the time. Instead of looking things up on the Web I had to find everything out from the locals. It was true immersion. The second time was in Lebanon. I started lessons after a few months. Lebanese is a harder language to break into, as there’s no real written form of it. But by the end of three years I could understand most of what went on, even in fast-moving social situations. However, meetings and the radio were still very hard. I also had my work (in French and English) and soon a baby to take up my time, as well as other priorities. This time round is the longest I have left it before starting any classes. I’ve spent the last year and a half in a bubble. I speak Spanish every day, but only the smallest of small talk, buying the veg, other mums at the park, neighbours in the stairwell. I have a few Spanish friends who speak reasonably good English. Life is too busy for me to go out looking for new friends just because they are Spanish. However, this time round there are also some advantages. The local language seems so much more accessible. Unlike Arabic, you say everything like you write it (albeit at top speed). Plus it is so similar to French. I’m not just talking about words like timide (FR) and tímido (ES – shy). Even phrases like no vale la pena (it’s not worth it), and hacerse pasar por (pretend to be) are so similar in form to the French equivalents ça ne vaut pas la peine, and se faire passer pour. There wasn’t a placement test for the classes at the Casa de la cultura. The secretary just enrolled me in the A2 level. From what I can tell, A1 is for absolute beginners, A2 for basic tourism, B1 for actually communicating, B2 for competency, C1 for fluency and C2 for mastery. When I got home and researched the levels, I decided A2 could be a bit slow. I know there will be stuff in it that I don’t know – in fact there’s probably a fair bit in A1 I don’t know yet. But with a kid in school, I am now officially out of my bubble. Not only do I have to talk to her teacher and to the other parents, I have more time to talk to everybody I meet all week, and more time to learn on my own. Also I know the past tenses, the future, the conditional and the subjunctive, when I see them. And I’m willing to work at it because I’m impatient to be able to communicate. So I tried the online tests, which I passed, up to and including B2. I’ve always been better on paper than in real life. Sad, but true. In fact, when I sat a similar placement test for Classical Arabic lessons years ago, I asked the teacher to enter me into a lower level than the one I qualified for, and the class I ended up in was plenty hard enough. There I was at a disadvantage there compared to many of the other students. Most were of Arab origin, so that gave them some background knowledge, concrete examples they knew were right, and a bunch of random vocabulary they could call in to play. This time I don’t feel any such disadvantage, as most foreigners here are English or Scandinavian or Dutch and can’t call on any knowledge of Latin languages. So I have been swotting up on my conjugations in the hope the Casa de la cultura will bump me up a level when I start. From now on I’ll be sharing what I learn here. I figure it makes an extra outlet to ease the avalanche my husband faces every time I come in the door, spouting all the expressions and grammar explanations I’ve learnt! For now, here is a bit of vocab from the scolastic baptism of fire. el desayuno – breakfast of course, however my school papers say the children must have desayuno before school but also bring desayuno with them in their mochila to eat before el recreo (break). So elevenses, or playtime snack, or tuck if you like. Le goûter for the French, but at the wrong time. At the beginning of the summer, we came across The Very Hungry Caterpillar at the local library, the Spanish version. Curled up on the sofa with my nearly-four-year old, I read it in Spanish, pausing when I think she can fill in a word she knows, like luna (moon) or hambre (hungry). After all, in September she starts school – 100% Spanish school. When I get to hoja (leaf), I pause, thinking she might know it. She suggests “feuilla?”, her own variation on the French word feuille. She’s completely wrong, but I’m pleased all the same. Clearly she has seen how similar French and Spanish are. Most of the time at least, even if not for the word leaf. When the caterpillar goes on a major binge on Saturday before building its chrysalis, I pause for her to guess at a couple of food items, like ‘queso‘ (cheese) which she gets right. 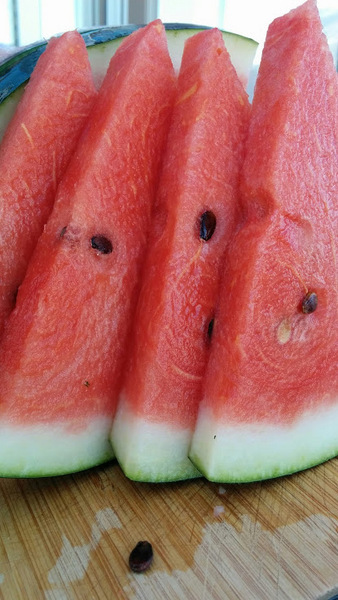 The last thing the caterpillar eats on Saturday is ‘un trozo de sandía‘, a slice of watermelon. When I pause tentatively, my daughter suggests: ‘pastequa?’ from the French pastèque. Learning Spanish naturally pushes you to draw on French or any other Romance language you may have some grounding in because of so much vocab in common. In addition, some grammar is more understandable to English eyes, for example, Spanish has two present tenses, giving equivalents to I do and I am doing whereas French only has one, je fais. And to top it all off, Spanish has a large vocabulary of words taken from Arabic, though many are altered past recognition. In fact, Arabic is said to be the second largest lexical influence on Spanish, after Latin, accounting for 8% of the Spanish dictionary. So with some knowledge of French, English and Arabic, I feel we should be able to get to the bottom of Spanish. Except of course there are some words which, at first, seem to have come from nowhere. Like hoja (leaf/feuille), for instance. Or hogar (home/chez soi). They don’t seem to have anything in common with their French, English or Arabic equivalents. It feels a bit odd, when words come from nowhere, because that’s just not possible. But then I noticed a pattern between Spanish and French. There’s definitely a shift from the initial F in Latin to H in Spanish. And I’d say there’s some kind of complicity between the L and the Spanish J – someone out there who’s done some Spanish linguistics would know. All of a sudden the fog clears and hoja does look a bit like feuille, or at least like folio and its variations. And while hogar can’t be made to resemble chez, it happens to share its root with foyer (from the Latin focus, or fireplace; and of course hogar and foyer also mean hearth). Even hacer, a word I learnt so long ago I never wonder about its origin, is apparently a cognate of faire. I even came across a Spanish sign asking people not to fumar (smoke, French: fumer) as we were in un espacio sin humo (smoke-free area, in French literally un espace sans fumée). So there you have both spellings in the same word group. Once you’ve got the pattern, all sorts of words make sense and become easier to learn. Now I know an F can hide an H just like J can replace an X, or like the German J often turns out to be a Y in English. The language nerd inside me is relieved, triumphant even; it does make sense after all. Funnily enough, it turns out sandía is from an Arabic word, but not the one I know, bateekh بطيخ , which is, however, the one which pastèque comes from. Sometimes with etymology you seem to end up right back where you started. 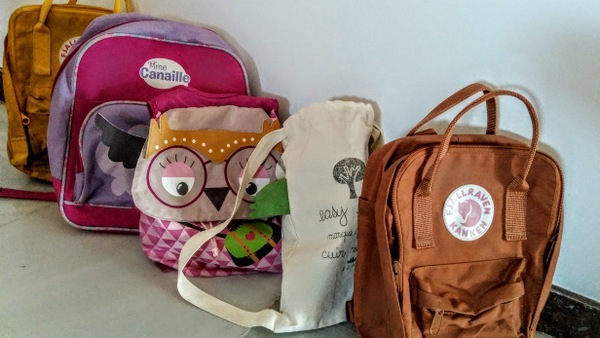 Although I do OPOL English with my kids I am still trying to indirectly bolster the French they get with their dad. We aim for consistent OPOL-ing, but we do allow ourselves to sing in other languages. Another good way I try is through books. Songs and books seem to work well as an exception to the OPOL rule, without undermining our consistency the rest of the time. It’s a bit like playacting, so it seems alright to transgress, as it were, into the other language, without fear of abandoning the spirit of OPOL. My husband, though, allows less transgression since his is the language with less support, while I actively seek to redress the balance of languages by making some of the kids’ “English time” with me count as “French time” by reading and singing in French…and occasionally in Arabic. In theory I’d prefer authentic resources in a target language. However, I’m short of some good suggestions for really lovely French books, and I don’t want to order a huge selection from Amazon, only to be disappointed. So in the meantime I have acquired a couple of translations. After my three-year old was given some Julia Donaldson CDs, including The Gruffalo, I got the French and Arabic versions of the book (more on the Arabic later). The whole collection has been quite a hit. The French translation is beautifully done and my little Beiruti already knows it by heart. It sticks close to the original without sounding forced. The repetition of “terrible” which rings so well in English has been replaced by a vast array of synonyms in French, a language which prefers to avoid any repetition at all (to the point that it has synonyms for country names eg Outre-Rhin for Germany, and transalpin for Italian). The only minor issue I had with it isn’t really linguistic, it’s more of a parenting qualm. The mouse says three times to the Gruffalo: “Tu vois, je ne t’ai pas menti,” – ‘You see, I wasn’t lying.’ In the original, although it is clear that the mouse is indeed stretching the truth when he says that all the animals are scared of him, the word “lying” isn’t used. When you are trying to teach a three-year old always to tell the truth, it doesn’t feel quite right to show lying as entertainment and I would have preferred to avoid an explicit reference. Otherwise we’ve been delighted with it. What have been your experiences with translations? Can anybody recommend some great original French books for 3-4 years old? This is likely the last year I’ll get to dodge the back-to-school rush. While everyone else was wrapped up in the “vuelta al cole” in September, I dawdled in the near-empty park with my two little ones, and enjoyed the peace of the library on weekdays. 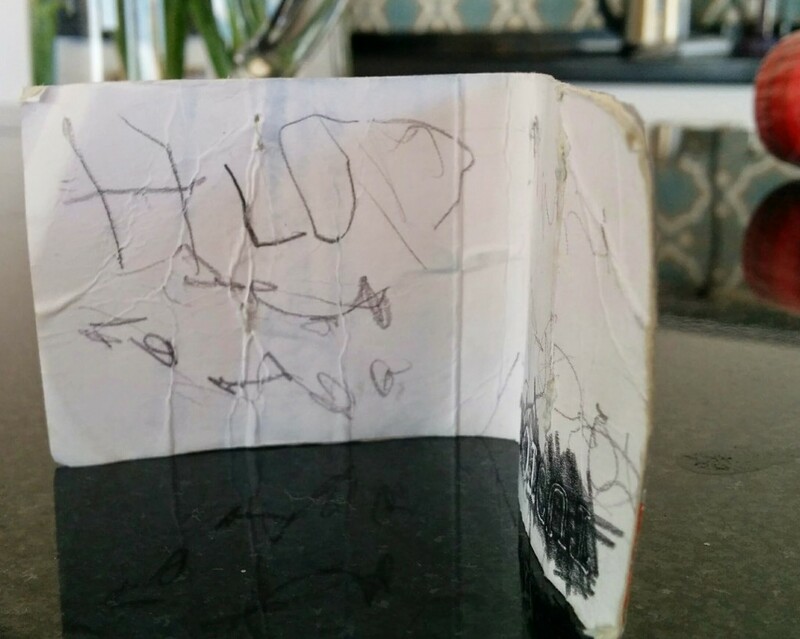 People are curious about why my three-year old isn’t in school, even though, like in most European countries, the mandatary age for schooling is six. Notwithstanding our disregard of popular opinion on the subject, it has been a very interesting phase in terms of learning. Some snippets from the past few months show that plenty of learning (including academic knowledge) takes place when kids are just getting on with life. My daughter wants to push keys on my laptop while I’m just completing an online purchase. I’d prefer not to have to start over due to some random button-pressing so I let her hold my bank card and read the numbers with me as I enter them. Next step is to click on “pagar” - pay. When I tell her this, she replies: “There are two words in Spanish for ‘pay’.” “Really?” I ask. “What’s the other one?” She replies: “La cuenta (the bill).” From which I gather that the local café culture has more benefits than just letting us sit back with a café con leche. I’m reading her Le Gruffalo (yes, in French,): “Une souris se promenait dans un grand bois profond…” (“A mouse took a stroll through the deep dark wood,” in the original text) and she interrupts to say: “But it says: ‘une sourisss’ “, pronouncing the silent ‘s’ at the end. It’s not the first time we discuss how we write X but we say Y. So we then continue reading the book (which she has learnt by heart in that way kids do) and randomly mispronouncing words the way they are written. A week later, “sur le neZZZ” (“on its nose”) still has her in giggles. In the meantime she is learning the illogical spelling of these words off by heart. “Tonight it’s pizza for dinner,” I tell her, pronouncing it pizz-ah. “And we say ‘peet-sa’”, she replies. She is studying a water bottle from the supermarket Carrefour. She points to the E in Carrefour, looks up and tells her dad: “On ne dit pas le ‘e’.” (We don’t say the ‘e’). Since no-one else was saying the word this means she had worked out what it said (in context obviously), pronounced it in her head, compared the spoken word with the letters, and spotted where the spelling didn’t match the usual pronunciation. 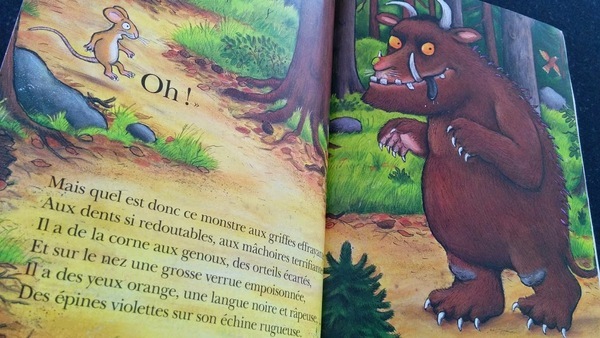 Update: More on the French and Arabic translations of The Gruffalo here. Teaching my 2-year old to read in English took a fair bit of thought. But French is a whole different ballpark. It is really hard to come up with short, common words which are easy to spell. We have been playing around with a multitude of short, easy English words which are read pretty much as they are written, letter for letter, such as cat, mat, rat, frog, sit, run, just to cite a few of the top of my head. In French there just isn’t the same abundance of phonemic words for tangible, everyday items. The same words in French require a much better level of reading, or a lot of guesswork. We have chat, tapis (or paillasson), rat (with a silent T), grenouille, s’asseoir (or m’asseois for first person), and courir (or cours if it’s I run). French is positively littered with silent letters, nasal vowels and strings of vowels. And verb endings are more varied too. However, French does have quite a lot going for it, from the viewpoint of a young (but not entirely novice) reader, that is. After all, French doesn’t have the random opaque pronunciation that English does. It isn’t full of contradictory patterns and churning with the exceptions that result from the English language’s mixed breeding. There is no French equivalent to the rough-cough-though-through conundrum or the difference in stress between the verb “to produce” and the noun “produce“, or the differing pronunciation of “I will read” and “I have read“, and other illogicalities. In fact once you can read in French, then you can read any French word, because pronunciation is quite consistent. Also, in French basic reading does get easier once the children can take on longer words (e.g. nombril) and once they are ready for a silent final ‘e’ (e.g. balle, nage, dessine, culotte). We are just about getting there and I can see that she has pretty much grasped that words are often written differently to what one would expect. She also reads well enough to be able to start taking on board the context whereas earlier all her concentration was focused on the letters. Now if we are talking about animals and she reads ‘KAN-G…’ she guesses that it says kangaroo long before reading all the letters. Much more like we adults read. This should help her to swallow nasal vowels and not pronounce chien as chienne or ballon as ballonne. After the complexities of English and French, when she learns Spanish at school, it will be a breeze, with it’s simple consonant-vowel-consonant-vowel patterns. The spelling reform certainly helped. As Wikipedia puts it, Spanish has “a relatively consistent mapping of graphemes to phonemes; in other words, the pronunciation of words can largely be predicted from the spelling.” Phew (or should I say Fyoo? ).